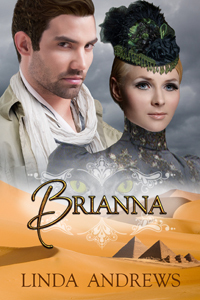 Paranormal Romance and More: Excerpt of Brianna by Linda Andrews! Excerpt of Brianna by Linda Andrews! “Brianna, can ye hear me?” Panic fed the primal rage bucking through Duncan. He bound the fury. A treasury agent had nerves of tempered steel, control of iron. A white lock rested on her pale cheek. Peppermint-scented breath slipped past pink lips. She was fine. She had fainted, nothing more. Nothing more. Yet she had not wakened. “I had thought she would be accustomed to violence, especially after the tales she told of Arizona.” Miss Phillips’s whine sliced through his musings. A man had been murdered, poisoned in front of a roomful of wealthy, influential witnesses. August would have been the likely suspect—it was his valet, after all. Except, he couldn’t have known his servant would be in the room, let alone would drink from the glass. So who was the intended victim? He laid Brianna on the plush carpet and knelt beside her. He brushed her bangs out of her eye, sweeping aside the feather headdress. And who was the poisoner? He might have spied something if he hadn’t dallied over his evening dress, and what had his delay accomplished? Not a bluidy thing. His hair still stuck up a little in front. As for the noose around his neck, he could feel the ends brushing his jaw. “Señor Stuart?” Esmé pried apart the Van Sargents. Worry pinched her features, increased the pitch of her voice. Two men in ship’s uniform squeezed through behind her, parting the assembled crowd. An elderly man in a somber suit appeared and set a black bag on the table. Shock flashed in her brown eyes. Her gaze flicked to the corpse before meeting his. He nodded. Relief flooded him. Duncan grabbed the small glass bottle—he didn’t trust the missionary any more than he did the others. Glass scraped glass as he plucked the stopper free. Ammonia invaded his nose, stripped the moisture from the back of his throat. Definitely smelling salts. He shoved them under Brianna’s nose. She winced, turned her head and coughed. Her eyes flickered open. Movement caught his eye. At the doctor’s nod, the burly crewmen lifted the body. Duncan shifted his weight to block Brianna’s view. Her lips parted; her eyes grew round. He had acted too late. She had seen the corpse. “Choked to death,” Van Sargent added with relish. “Such a terrible tragedy,” said Miss Phillips, dabbing her dry eyes. Duncan’s skin crawled as Mrs. Van Sargent beamed down at them like a goddess spreading her benevolence. “But he—“ Brianna’s nails dug into Duncan’s arm. ”Choked to death.” He kept his voice firm, his tone final. Brianna had been around death most of her life, was intimately acquainted with most of its faces. He wouldn’t allow her knowledge to get her killed. Love, lies, and an ancient Egyptian curse. Brianna Grey holds the key to mankind's destruction and someone is willing to kill for it. Having spent most of her life dying, one man's kiss has resurrected her desire to live. For US Treasury Agent, Duncan Stuart, love means death. He works alone, lives alone and plans to die alone until he meets Brianna again. Under the harsh Egyptian sun, Duncan will break all his rules to save her but will it be enough to overcome the secrets that could get them both killed?